I didn’t give too much thought to where to have dinner. I’d already pretty much decided to eat at Brasserie Le Central. 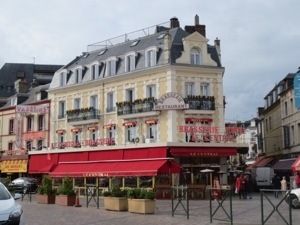 There are two serious brasseries in Trouville: Les Vapeurs where I ate on Sunday evening and right next door to it, Le Central. They adjoin each other and look so similar outside you have to look carefully to see where one’s tables end and the other’s begins. I’d also decided it was time for oysters. 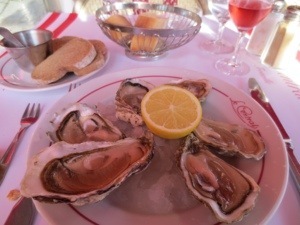 I’d been on the Cote Fleurie coast for four days and hadn’t yet eaten an oyster. I’d seen them in markets and huge displays of them in the fish market opposite the brasseries so it was definitely time to indulge. I sat outside in the covered terrace and ordered a Kir. Then my oysters came. Oh the glorious pleasure of indulging one’s appetite for these little jewels of the sea. They came with a vinegar and chopped onion dressing but I prefer them undressed. The naked oyster. That first mouthful, a deep taste of the sea, followed subtly by a soft creaminess, giving way to minerals. It’s sublime. There is nothing like the oyster. 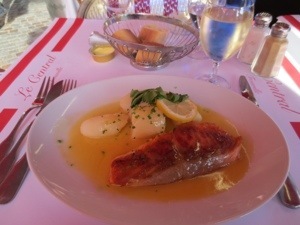 To follow, I chose a salmon plat du jour. It came swimming in a beurre blanc sauce. Well, I am in Normandy. And it was served simply with steamed potatoes and a dusting of parsley. They’d achieved a wonderful crisp crust to the salmon, cutting through to soft, delicious flesh. I’d seen cherry clafoutis on the blackboard but was told it was finished. Presumably at lunchtime as I was dining quite early. Instead I chose Tarte Tatin from the main menu. One of my favourite desserts. 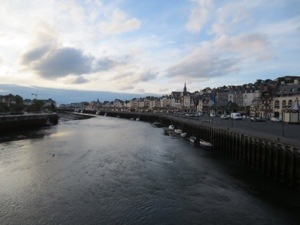 Then I finished with a coffee (no calvados as I’d been given next door). It was a good meal and nice sitting outside in an informal setting with the view. A French family of what seemed like grandmother, mother and daughter sat next to me and were friendly although didn’t try to exchange a proper conversation. A French couple at a nearby table laughed and talked a bit with me when I first sat down. My waiter was nice enough and efficient – although I did feel rather hurried. Plates were whisked from me almost as soon as the last bit of food was in my mouth and not even eaten. I think it’s worth saying here – with reference to why I first started the blog, to look for places to eat and stay where a single woman was welcomed and not made to feel awkward – that eating at Le Central was the first time I’d felt a little uncomfortable in the two years since starting the blog. Maybe it was the partly the waiter’s desire to speed me through the meal but more it was the unfriendly looks the maitre d’ kept throwing me. Dressed in a too shiny black suit without his tie not properly done up, he didn’t really look for the part for a smart brasserie. He welcomed other people effusively but said not a word of welcome to me – only gave me those looks. It didn’t spoil my meal. In some ways it’s quite funny he should be suspicious of a lone woman diner but more seriously, it’s just not acceptable. So, although I enjoyed my food I won’t go back. But I do intend to go to the far more welcoming Les Vapeurs again – probably on my last night. 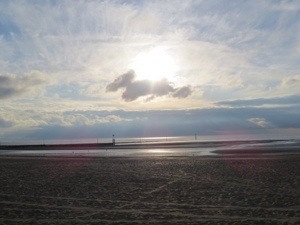 There was finally a shimmer of sun in the dying light and I walked back up to the nearby Trouville beach for a little while, sitting on a bench and enjoying the peace and sea air. 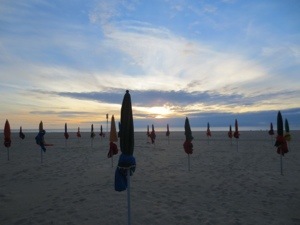 Then I slowly made my way back across Pont des Belges to Deauville and on up to Deauville beach to catch the last of the light. Eating lovely food in a good restaurant can be a strangely challenging experience for the woman traveller on her own. I thought this expressed the diner’s unease perfectly. Many working women now have to travel alone. The working bit can be fine but ‘free time’ can seem a bit odd! Will be interesting to know if others feel this. Thank you, Jane. Have to say was a little surprised. I wasn’t treated badly – just not in as friendly a way as it appeared others were. Oh dear. Well I’m pleased to hear about the owner. Really, it didn’t upset me in any serious way. I’m very comfortable dining out alone. But I know some women aren’t or have had bad experiences so I like to address that on blog when appropriate.